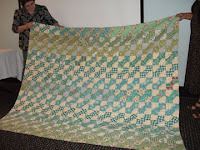 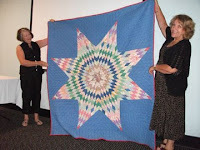 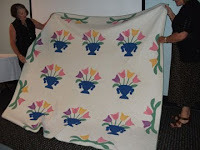 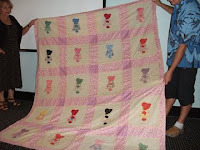 Many of those attending the talk then brought out their quilt and feed sack treasures for us to enjoy. Annette Gero, Alan Tremain, Karen Fail and Melinda Smith had quite a few of their own 1930s quilts, quilt tops and feed sacks for us to look at. 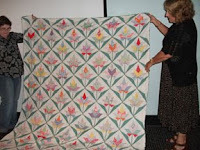 There were some unusual patterns and colours amongst the quilts including a number of embroidered quilt tops, a feed sack pre-printed for embroidering and one cot quilt – these usually do not survive. The show and tell generated a long discussion about dating fabrics and patterns from this era and the appropriate techniques for handling and cleaning such fabrics and quilts. By the end of the event, we had more than 35 quilts and quilt tops, along with 11 feed sacks decorating the room for our closer inspection.